Jason Alexander, though certainly a multifaceted actor with a wide array of stage and screen accomplishments, remains inextricably linked to playing George Costanza on Seinfeld. Narrating Douglas's latest memoir, Alexander walks a delicate tightrope. He speaks in a sage-like tone and pitch that capture the spirit and essence of Douglas without falling into the trap of mimicry. 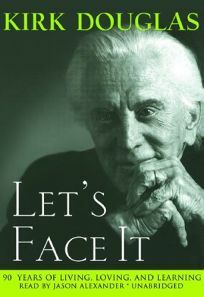 Some of the most delightful passages involve Douglas's recollections of witty exchanges among his show business contemporaries, almost all of whom the 91-year-old Douglas has outlived. Like many leading men of his era, Douglas was forced to downplay his ethnic heritage on the way to mainstream stardom, so his memories of Yiddish culture are especially poignant. Alexander treats the material with grace and dignity. He also delivers an especially memorable portrayal of Douglas's devoted wife Anne. Granted, some of the musings about contemporary politics and pop culture may seem random, but fans looking to savor a connection with a living legend will not be disappointed. A Wiley hardcover (reviewed online).